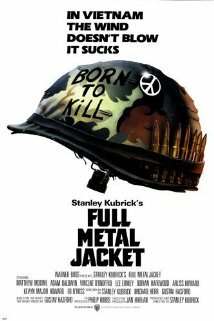 The Less Desirables Movie of the Week, sponsored by a/perture cinema, in Winston-Salem, is Full Metal Jacket. FMJ is one of my all time favorite films. It’s gritty, it’s mean, it’s lewd, it’s hard and “it’s so horny.” Stanley Kubrick was a genius and this was one of the greats from him, in my opinion. The film had several stars that may or may not have been on the radar before this film and some that faded afterwards. Private Joker as portrayed by Matthew Modine was probably his finest role. R. Lee Ermey played Gny. Sgt. Hartman and was a drill sergeant in the armed foreces prior to his gig. He was dead on, too. Adam Baldwin as Animal Mother and his ruthless, wanton ways was a beast. And, who can forget Vincent D’Onfrio as Private Pyle. Let’s just say the evil look on his face in the bathroom before the stuff goes down, is priceless, very intense and very scary. I don’t know if the film was really comparable to what that time was like or not, as I wasn’t yet born, I don’t think. But, having never been there, if it was worse than this film, I’m so glad I wasn’t and don’t want to think of the reality of it. You wonder if a film can really ever capture that kind of reality, and also you wonder, would you want it to? Many memorable lines, characters, actions and visuals laced the entire movie. There wasn’t really slow spots as much as “calms before the storms.” Just like in real life Vietnam, not everyone got to come home and even the beloved characters had to face that music. As much as I’d hate to have lived through any of that, the late 60s and early 70s are one of my favorite times to watch films about. Films like Good Morning, Vietnam, Forrest Gump and Platoon highlighted the war but films like The French Connection, All the President’s Men, Silkwood and even Boogie Nights just showed the rawness and grittiness of the times, in general; how the war affected everyone in some aspects and what it was like to live in that time, at least cognizant recognition of it. I love stuff from then. Love it. So, I saw this on Netflix and I rated it 5 Stars. It is one fantastic film, from beginning to end. Highly recommended from me. Tune in to The Less Desirables to hear Eugene‘s and the guest’s comments on the film, as well.